In the classic Simpsons episode "Duffless," noted beer enthusiast Homer gives up his beloved Duff beer for a full calendar month. He follows through, abstains from beer for 30 days, and becomes a better person because of it -- riding off soberly into the sunset. But if you've watched the show since that episode aired in 1993, you know that Mr. Simpson has, if anything, only increased his love of that wonderful Duff. Once again, The Simpsons has predicted our bleak future. Participating in a personal Prohibition during the first month of the year has become a trendy resolution fit for social media, complete with a hashtaggable handle: Dry January. But it's not just silly because of all the smug Instagram posts touting the wonders of short-burst sobriety like it's a purple sesame acai bowl with a glow stick inside it. For starters, you are quite likely to circle right back to the bottle like a booze-craving boomerang once the calendar flips to February. And that's just the tip of the "hey, don't do this" iceberg. Your Dry January is dumb. Hell, even an addiction specialist agrees with me here. For the (somehow) uninitiated, Dry January is a colloquial term to describe abstaining from alcohol for the first month of the year as a kind of abbreviated New Year's resolution. You probably know someone who's tried it and won't shut up about it, even if you don't recognize the name. Despite its continuing and mounting prevalence, there's really no empirical evidence that this accomplishes much of anything aside from saving you money on your bar tab, and letting you say, "Hey, I didn't drink for a month!" without feeling like a liar. Are you saying a month without drinking is… bad? 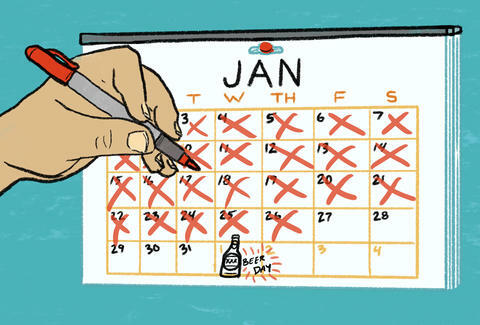 Don't get it twisted, Padawan: Giving up alcohol for any amount of time -- a month, a few days, a week -- isn't something that should be discouraged. But, if you are at a place in your life where you feel your relationship with alcohol needs evaluation, there could be a chance you have a serious problem, and Dry January is not the solution here. So unless you are doing it strictly for (sober) shits and giggles, you probably want to use an alternative method for drying out. If you really want to cut down on drinking, cold turkey probably isn't the best way to go about it. 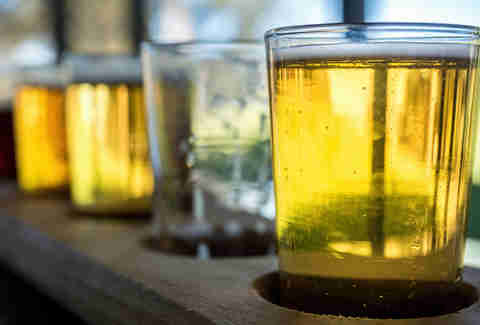 "If you are at the point where you need to take a month off drinking, or take stock in your relationship with alcohol, the 'cold turkey' method could present some serious health issues," said Dr. Marc Romano, an addiction specialist at Pompano Beach, Florida's Ocean Breeze Recovery who clearly knows more than you and/or your Facebook friends about recovery, addiction, and evaluating your relationship with booze. If you are drinking every day -- or even every other day -- a sudden hiatus in habit could lead to serious complications, including life-threatening seizures. "Of course, not everyone is going to have seizures if they give up drinking. It all depends on gender, height, weight, frequency of alcohol consumption, all those variables -- but there's really no way to know till it happens," Romano said. "Is that a risk you are willing to take?" So yes, even if you aren't downing a Moscow mule with breakfast every day and only drink, say, four days out of the week, you could (key word: COULD) develop some dangerous symptoms from abrupt withdrawal. Really, this is about being safe. If you're dependent, you need to detox under the care of a professional. But straight-up safety isn't the only concern here. Psychologically, your Dry January could be doing more harm than good. The "rebound effect" is real. Very real. "It's been shown that people who engage in intense short-term diets actually end up putting on more weight when it's all said and done," Dr. Romano said. "And the same logic applies here, for sure." Think about it this way. You've been eating too much pizza lately, so you give up pizza for a month. But as soon as your pizza Prohibition ends, after months of thinking about pizza and how hard it is to give up, you are probably heading straight to Famous Ray's… or at least the freezer for a quick hit of Bagel Bites (which is like the freebasing of the pizza world). It's overcompensation. And it's predictable, because it's human nature. Personally, I know that every single Dry January participant I've know has had a pretty wild Wet February and immediately looked to clean up the local pub harder than some kind of mythical Shamwow/Dyson hybrid as soon as 2/1 rolled around. Who could blame them? Once you're sober for a month, you want to get back to drinking. And with a month off, your tolerance is lowered. Meaning the first time you get back off the wagon, you are probably going to overdo it. "It's definitely possible, and probably likely, that anyone doing a Dry January run will probably bounce back even harder once their month is over," Romano said. "In reality, there's a much better way to go about this." It might not have a catchy name or a convenient hashtag, but a safer and more effective alternative to Dry January is simply controlling the amount you drink over a long period of time. "If you are really looking to change your relationship with alcohol, to scale back, or even take a hard look at it, you are much better off just trying to drink in moderation, over time," Romano said. For instance, if you usually drink two glasses of wine while cooking dinner on Thursday, try drinking one. Or instead of drinking any wine while cooking dinner during the week, set a hard rule that you'll only drink on the weekends. If you normally go out and drink a lot on Saturday night, try setting a two-drink limit before cutting yourself off. Not only will this help you curb your consumption, it will also allow you to do so at a gradual pace, in ways that you can incorporate into your regular life -- instead of simply enduring a brief period of sobriety, then heading right back in the wrong direction. "Teach yourself some healthy behaviors and try to instill them in your routine. Set limits for yourself and stick to them. This will teach you behaviors that you can continue to use. Everyone is different. But limiting your consumption this way is much healthier, and you'll probably find more long-lasting success," Romano said. "You aren't going to learn any behavior modification going cold turkey. You are basically just going from one extreme to the other. And in that case, what's the point?" There's no harm in having a couple drinks a week -- but there is some potential harm in participating in Dry January. If you really want to cut down on your drinking -- or evaluate your relationship with alcohol -- you are pretty much wasting your precious time. Unlike Homer Simpson, your liver is not animated… and you can't stay 39 forever.